Ask Analytics: Let's start learning R ! Let's start learning R ! Starting the tutorial on R @ Ask Analytics. We are in the process of learning R, hence sharing all our notes with you. We are on a mission of simplifying R. Covering few basic things which are must know to start the programming in R.
We recommend to install R and then R-Studio in you PC as working directly on R is not very user friendly. 1. 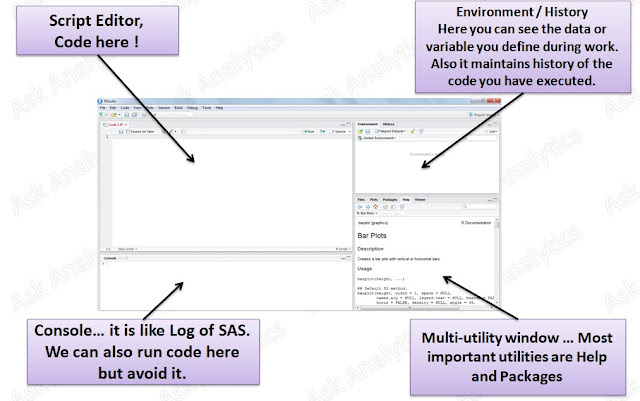 Unlike SAS, R is case sensitive in all respects. Here “a” and “A” are different objects. 2. Equality operator for assignment purpose is “<-” or “->” or “=” . All these are same. I prefer to use "=" as I am primarily a SAS programmer and old habit die hard. 3. Any statement starting with # is considered as non-executable comment, but it can not be of multiple line. For multiple line comment, use # in start of every line. 4. Ctrl + Enter or Ctrl + R command is used to execute a code in Script Editor window. The best to learn any language or script, best way is start writing the code. Please do not copy paste as it won't help you learn much. Now when we know how to create vectors, let's learn how to select a part of vector and how to modify it.